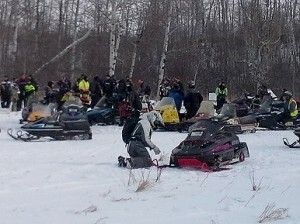 The Swan Valley Snowmobile Association held their 9th Annual Vintage Ride on Saturday, February 27, 2016. The day started out with a pancake breakfast hosted by the Bowsman and District Lions, which once again was a great success. The vintage ride, even with the unfavourable weather conditions, turned out to be one of the best attended rides to date. There were 63 vintage machines registered for the ride, with riders ranging from young to old. Everyone was able to have some fun despite the gusting winds and heavy snow. The sausage pit stop was also enjoyed as it was a break from the cold winds and drifting snow. It also gave riders a chance to check out their favourite sled and gas ol’ faithful up for the home stretch. Back at the museum prizes were awarded and the meal was served. Everybody enjoyed the turkey on a bun, salad, hot dogs, drinks and donuts. A big “Thank You”, goes out to all the organizers, trail markers, cooks and businesses that donated either food or prizes. Without all the volunteers and businesses the ride would have not been possible. So thank you again, to everyone that made the ride a success!